The fall in Brent came after the dollar reversed early losses to rise 0.24 percent against the euro <EUR=>, making dollar-priced commodities more expensive in the euro zone. Brent futures for May delivery <LCOc1> settled at $55.11 per barrel, down 81 cents. U.S. crude oil rose 6 cents to settle at $47.51 <CLc1>. The U.S. Commerce Department announced that new home sales jumped 7.8 percent to a seasonally-adjusted annual rate of 539,000 units last month, the highest since February 2008. Financial information services firm Markit said its U.S. Manufacturing Purchasing Managers' Index rose to its highest since October. U.S. crude stocks, already at their highest in at least 80 years, were forecast to have risen for an 11th record-breaking week, an expanded Reuters survey showed Tuesday. 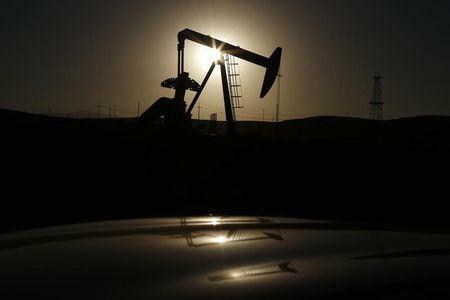 In the week to March 13, U.S. crude stocks rose nearly three times as much as expected, according to U.S. Energy Information Administration data. The U.S. Energy Information Administration's inventory report is due at 10:30 a.m. EDT on Wednesday. Oil prices were also under pressure on Tuesday from data showing factory activity in China slipped in March, adding to concerns about growth in the world's second largest economy and top oil importer. U.S. factory activity increased slightly. The Chinese data followed comments from OPEC kingpin Saudi Arabia that it is pumping around 10 million barrels per day (bpd) of crude, close to an all-time high and some 350,000 bpd above the February output it reported to OPEC. BP lifted its force majeure on oil loadings from Angola's Saturno stream, which typically exports about 150,000 bpd. The suspension in operations began on March 16 when power was cut off to some fields.